Recently Doug Miller, webmaster at the excellent Pan Am Historical Foundation website, shared a very interesting story with me. Miller was contacted by the son of a Wake Island civilian contractor who had in fact escaped the island aboard the Philippine Clipper following the initial attack by the Japanese on December 8, 1941. In all my research I had never come across any mention of a contractor seizing the opportunity for a ride out that fateful day. But young Tom Cleary did. Mike Cleary shared his recollections of the family story, as well as newspaper clippings and other documents relating to his father’s time on Wake in 1941, his dramatic escape, and his subsequent service in the Marine Corps. Tom Cleary, a 1940 Oakland high school graduate and football star, decided to have some “adventure” before settling down to college. He signed up for the Pacific job in the spring of 1941 and sailed from San Francisco on the SS President Taft on April 20. Cleary likely arrived on Wake in May as hundreds of workers swelled the population now that the “permanent” navy work was underway. Employment records list him as a carpenter apprentice, though Mike states that he worked as a concrete technician, checking the quality of concrete before it was poured. 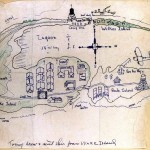 Sometime during his stay he drew a detailed map of Wake Island. I have a special fondness for these old hand-drawn maps and am delighted to share Tom Cleary’s 1941 map in the gallery below. On November 22, 1941, Cleary left Wake for nose surgery in Honolulu, possibly to repair an old football injury, and returned shortly before war broke out. A 1942 Oakland Tribune article states that he returned to Wake on the Philippine Clipper that arrived December 7 (across the International date line), which I initially found unlikely, given his youth – just turned 19 – and relatively low employment status. But the last ship to bring men to Wake was the USS Wright that departed Hawaii November 20, too early for Cleary; the Burrows left Hawaii November 28 carrying men for the job, but it was still at sea when war broke out and was recalled to base. If a seat was available on the westbound Clipper on December 5, Cleary might well have been in it. In any case, he was taking his lunch in the mess hall on December 8 when the Japanese bombers came calling. As I relate in Building for War, twenty-seven enemy planes dropped out of the cloud cover near noon and bombed and strafed Wake’s airfield, the contractors’ camp, and the Pan American base on Peale. This first attack took less than fifteen minutes, but inflicted terrible carnage and damage, especially at the airfield and the Pan American complex, which was ablaze. Looks like I need a new footnote: almost all declined, except for Tom Cleary, who had come to the Pan American dock after the raid and heard a crewman shout something like, “jump on kid, this is the last flight out!” Or “are you coming along?” If in fact Cleary had flown in with the crew the day before, they may have recognized him or singled him out. Whatever the case, he did jump on and got away. 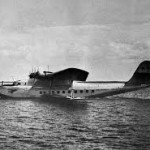 Captain John Hamilton flew the Philippine Clipper east to Midway where it was quickly refueled in the dark, and then on to Oahu where it landed in the smoking, debris-strewn Pearl Harbor the next afternoon. Accounts tell of the crew and passengers being whisked away for debriefing by naval and Pan American officials, and later flying on to San Francisco, but there is no word of what happened to the tall teen. Somehow Cleary made his way through the next couple of weeks and got passage on the SS Matsonia that sailed from Honolulu on December 26, arriving San Francisco on New Years’ Eve. Tom Cleary’s harrowing experience on Wake Island gave him direction: as the Oakland Tribune reported, it was “the ruthlessness of this attack that stirred him to join the Marines.” Cleary enlisted in the USMC shortly after his return stateside, joined by three of his high school friends, and at the end of boot camp was recognized as the outstanding recruit in his platoon, honored for his aptitude and efficiency in operations training. He joined the new “Carlson’s Raiders” commando battalion and was in the raid on Makin Island in August 1942, then on to combat at Guadalcanal and Bougainville, where he was severely wounded in November 1943. Cleary passed away in 2009. Many thanks to Mike Cleary and to Doug Miller for sharing this great story of the one who got away.